Villeroy & Boch (Mettlach, Saarland, Germany, established 1836), design attributed to Franz von Stuck (German, 1863–1928). “2106” Stein, 1894. Stoneware, with colored slip and glaze decoration, platinum luster, and pewter. Gift of the René von Schleinitz Foundation M1962.890. Photo credit: John R. Glembin. Around the turn of the twentieth century, German companies appealed to their customers with many types of humorous steins. As we saw last time, sometimes they made a joke by means of a pun. Here is another Mettlach stein the Milwaukee Art Museum’s collection using a common German turn of phrase in a funny way. 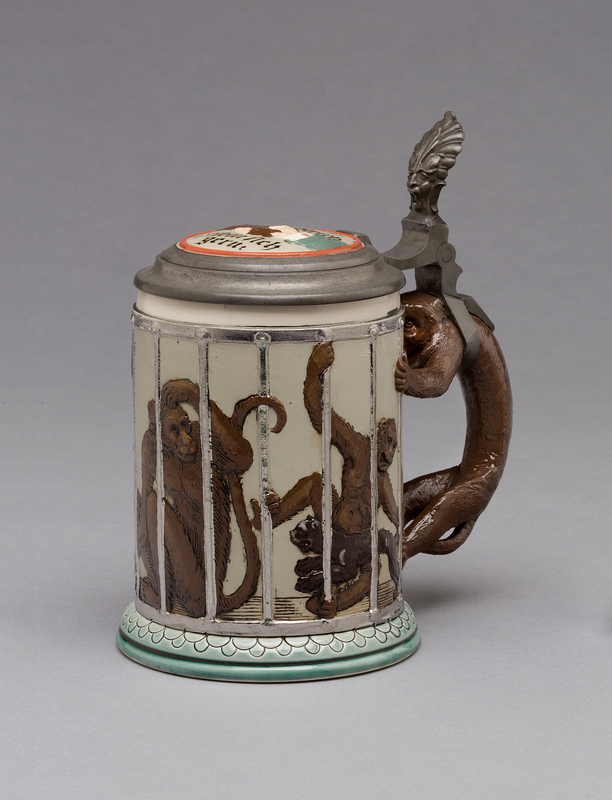 It shows monkeys in a cage, and the handle is even made out of a monkey. Since the seventeenth century, monkeys were often used in art to lampoon the actions of humans (find out more in this post about our painting by Paul Friedrich Meyerheim). That’s no different on this stein! The complete meaning becomes clear when you look at the lid. We see a man shake the hand of a monkey surrounded with the saying “Gleich und Gleich gesellt sich gern”. In English, this translates to “equals like to keep company”, or, as I like to say, “birds of a feather flock together.” The humor here is both meant to elicit a laugh but also be a warning not to imbibe too much. 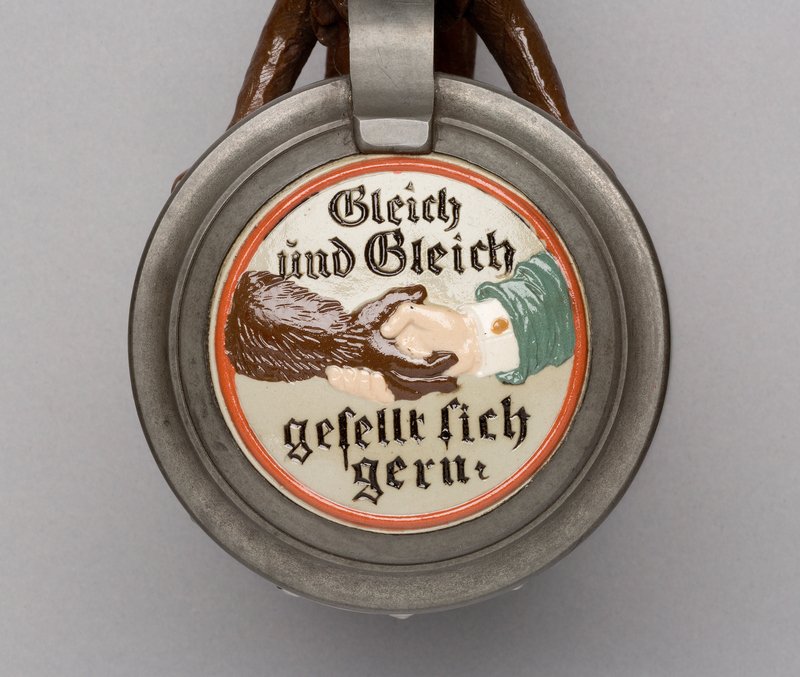 And as you may remember from previous blog posts about steins, these objects were often used to identify a man’s social network, making the warning even more appropriate! 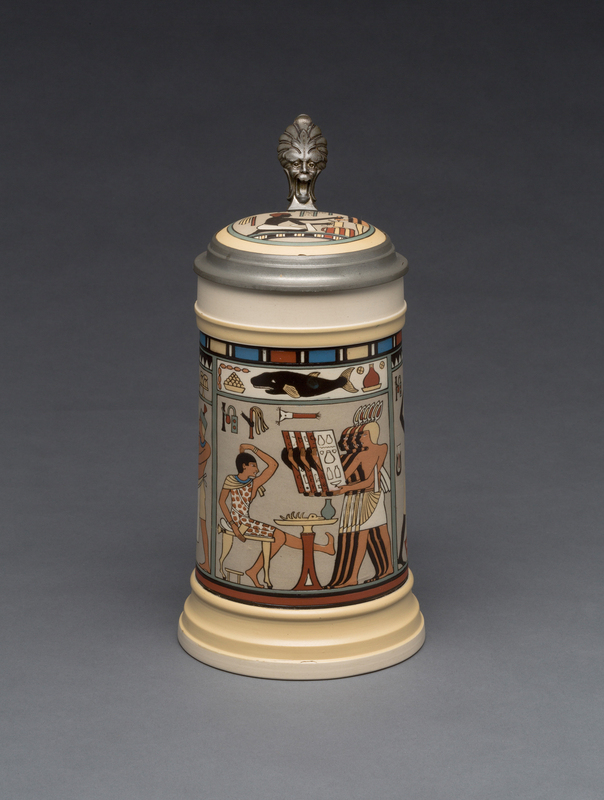 The second Mettlach stein we’ll consider in this post uses Ancient Egyptian imagery for its inspiration. 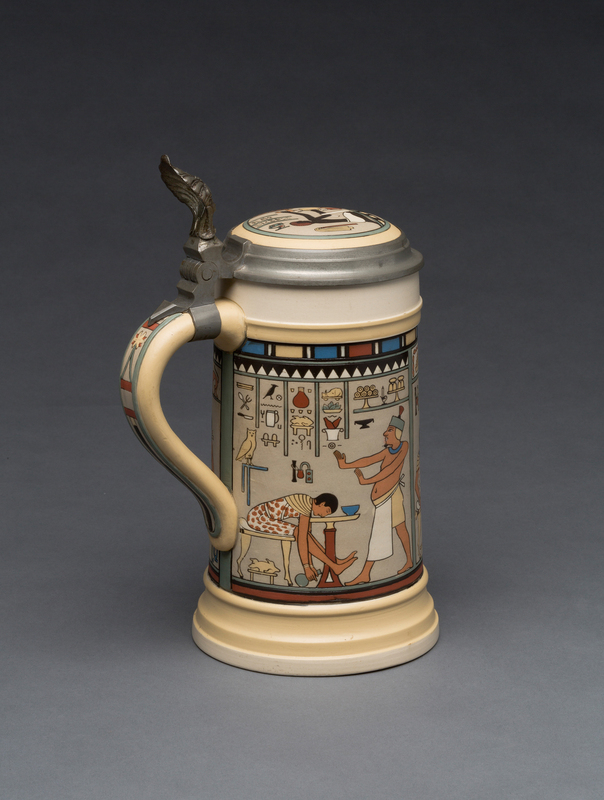 That might seem odd, but the Germans were at the forefront of new developments in archaeology, so using it on a stein is both evidence of nationalistic pride and proof of a good education. In this case, the clever designer Fritz Quidenus (German, 1867-1928) bases his decorations on an Egyptian offering painting. These offering scenes are founds in tombs, where the deceased is given things he’ll need in the afterlife, such as food. On the stein, Quidenus shows a man sitting at the table is offered four tablets that look like menus. He scratches his head, uncertain what to order. The sides of the stein tell the rest of the story: the same customer is passed out at the table, his cup still in his hand—clearly he’s had a few too many. And check out the fake “hieroglyphs” at the top, showing eating utensils and foot items. On the other side he’s involved in a tavern brawl, chased out of the room with one of the waitstaff wielding a flail, or threshing stick, the table toppling before him. The lid of the stein shows one of the waitstaff carefully filling a beer stein. The comic-strip-style narrative is obviously meant to be funny! 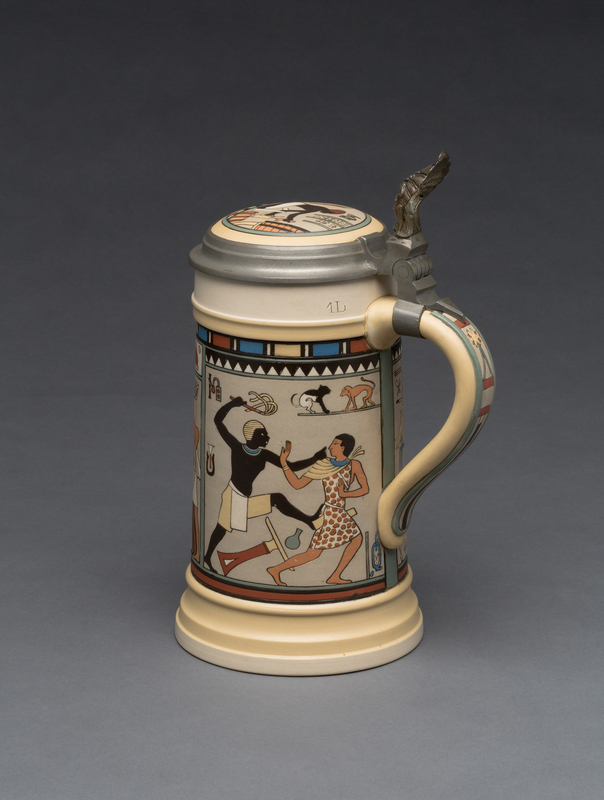 Next time we’ll look at another type of stein meant to amuse: character steins. This entry was posted in Art, Curatorial and tagged European art, From the Collection, steins. Bookmark the permalink. Hahah, these are great! I really wish I had the monkey one.